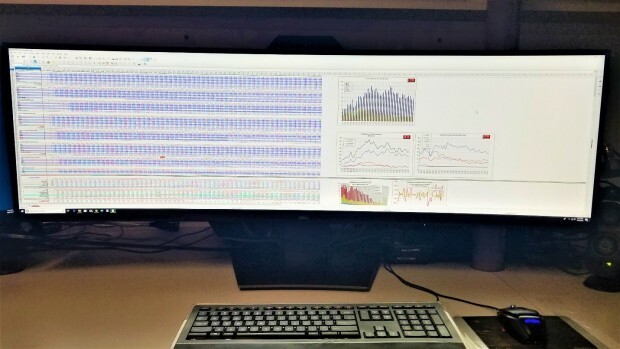 Dell may have just killed the multimonitor market, well, at least put a big dent in it. 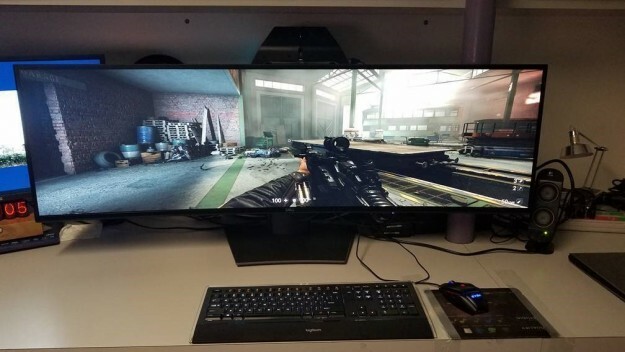 The company has just released a 49-inch, 5120 × 1440 resolution (32:9 aspect ratio) curved, brilliant 350 cd/m2 monitor that supports 99% of sRGB (1.07 billion colors) with a 1000:1 contrast ratio with a 5ms response time IPS panel. 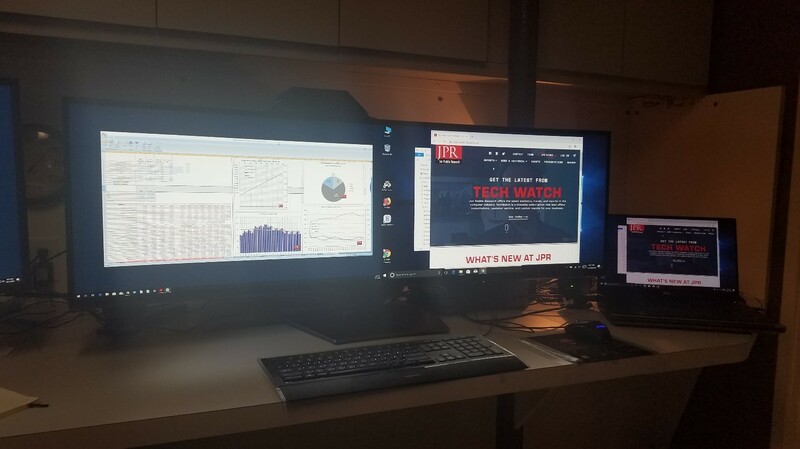 One of the first groups to use multiple monitors were the financial traders, stacking up to six or more. That was expensive and required a rigging system to hold them in place and get them properly aligned. Dual monitor users include engineering and media post production too. 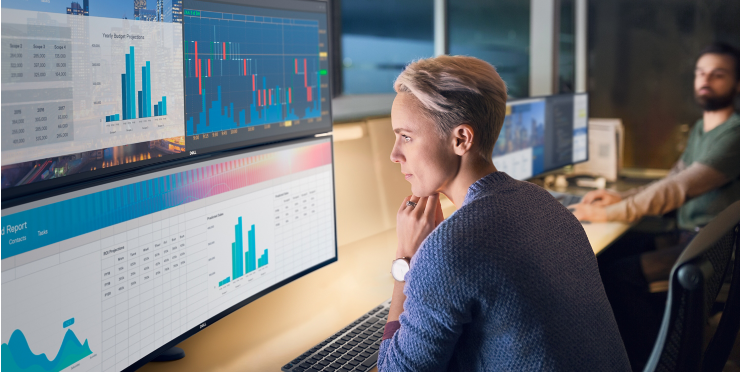 The U49 is positioned as a replacement for two 27-inch QHD monitors with the added advantage of an uninterrupted view — no bezels, no matter how thin. It has a sufficient number of inputs as well: 2 x HDMI 2.0 (HDCP 2.2) (10-bit color @ 60Hz), 1 x DP 1.4 (HDCP 2.2) (10-bit color @ 60Hz), 5 x USB 3.0 Downstream port, 2 x USB 3.0 Upstream port, 1 x USB Type-C (Alternate mode with DP1.4, Power Delivery, and USB2.0) (8-bit color @ 60Hz). One of the important aspects for a widescreen monitor is the ability to see it from a wide angle. The U49 offers an impressive 178-degree horizontal viewing angle and a178-degree vertical viewing angle, one of, if not the, widest in the industry, so you won’t get any fade out or black spots. You can adjust it up and down (90 mm) and tilt it (-5-degrees to 20-degrees). It’s remarkably light for such a large screen, only 11.4 kg (~25 lb.) so one person can easily install it. A lot, we think a lot about this new monitor. It’s a new class of monitor as MSI, Phillips, and Samsung have (or will soon have) similar products. That’s a good thing because it means it is a category that the monitor suppliers are going to promote and support, so there won’t be any orphans. I said they will put a dent in the multi-monitor market and they will. Losing the bezel is a big deal. The U49 is the equivalent of two 27-inch 2560 × 1440 monitors with the added niceness of a curved screen. But, if 7.4 megapixels isn’t enough for you (it’s not enough for me), then you can stack them — remember, only 11.4 kg. However, as interesting as spreadsheets are, one can only look at them for so long before the eyelids get heavy and you wake yourself up from your own snoring. But if you want to stay awake, light up Wolfenstein II with the U49. One of the complaints gamers have is limited FOV. Well if 178-degrees isn’t enough FOV for you then you need to join a circus cause there’s something weird about your eyes — although you’ll never have to worry about anyone sneaking up on you. Dell says this is not (positioned as) a gaming monitor, but gamers are going to use it for sure. And since its only (ha, only) 350 nits it doesn’t qualify to be officially called an HDR monitor, even though ti can display 10-bit color. But it’s HDR enough for me. I can tell you the blacks are black, and I can see more in a game in color and width than I could before. This monitor is one of the most exciting things I’ve seen since I got the first 30-inch HD CRT Sony Trintron monitor in 1997 — although I do love my 8k screen.